The literal meaning of a ‘musketeer’ is as the name suggests, a soldier armed with a musket. At the time when they came about, musketeers were the modern soldiers, as the musket was considered advanced technology. However, the musketeers were later replaced by riflemen, i.e. men carrying rifles. 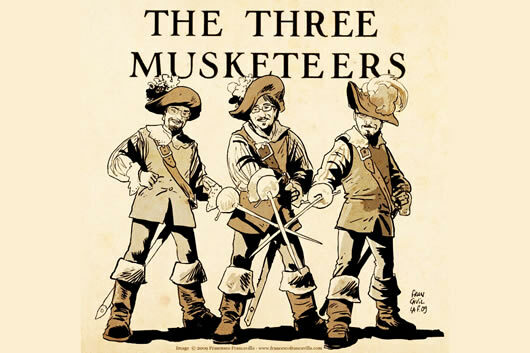 In common parlance, the term Musketeers has been made famous by Alexander Dumas’s novel, “The Three Musketeers.” The novel follows the story of a young man, named d’Artagnan who wants to become a musketeer in the ‘Musketeers of the Guard’ like his father. The ‘Musketeers of the Guard’, also known as the Royal Musketeers, were a fighting company that were part of the Royal Household of the French monarchy. They were a part of the military branch, and were tasked with the security of the Royal Household and especially the king.